Coming off a 5-4 loss to the Florida Panthers on October 7, the Tampa Bay Lightning bounced back on Monday night with a 4-3 overtime win over the NHL’s leading goal scorer Alex Ovechkin and the Washington Capitals at Amalie Arena. This game proved to be a big test for the Lightning. After coming off a poor defensive effort against the Panthers, the team was up against the hottest player in the league in Ovechkin, who was coming off back-to-back hat tricks. The Lightning answered the challenge by holding the six-time Rocket Richard winner off the scoresheet, while he finished a minus-2 on the night. Despite falling behind early, Jon Cooper’s team came from behind to win their second of three games to start the 2017-18 season. Brayden Point, Nikita Kucherov and Alex Killorn led the way offensively for the Lightning, each picking up a goal and an assist. Chris Kunitz got his first goal as a Bolt, and Andrei Vasilevskiy was stellar once again with 23 saves, some of those being key ones to keep his team in the game. The Lightning have been burned by the Capitals power play in the past and knew that it was important to stay out of the penalty box coming into Monday night’s matchup. They ended up taking four penalties and conceded two goals with a man down, and it nearly cost them the game. Both power play goals were scored by T.J. Oshie to put the home team behind two goals on both occasions. Certainly, this will be a lesson learned for the Lightning as they know they can’t afford to give teams many opportunities on the power play, especially a team with as much firepower as the Capitals. The team’s penalty killing has been an issue in the past but had been addressed last season, as they finished a respectable 13th in the league in that department. The Lightning will need to have a reputable penalty kill once again this season if they want to have success. A major issue for the Lightning in their first two games against the Florida Panthers was their lack of shooting. They fired a combined 55 shots in their home-and-home with the Panthers while giving up 84 and were fortunate to come away with one win out of two. The Lightning were much better Monday night as they fired 40 shots on goaltender Philipp Grubauer, led by Steven Stamkos and Victor Hedman who each had seven. This team has too much offensive talent not to be taking over 30 shots per game. 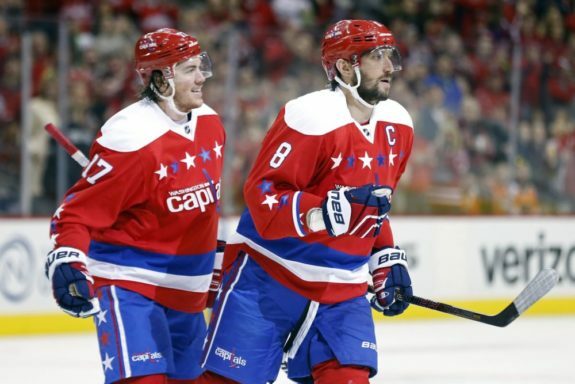 Against the Capitals, they showed that they can take control of the game quickly when they shoot frequently. While the Lightning also struggled defensively against the Panthers, they were much better in their own zone against the Capitals and that was mostly because they had the puck more, especially in the second half of the game. If the Lightning can keep playing with a shooter’s mentality, they will be among the league’s highest-scoring teams this season. With the Lightning down by a goal in the third period, Kucherov took matters into his own hands and forced overtime with a spectacular goal. 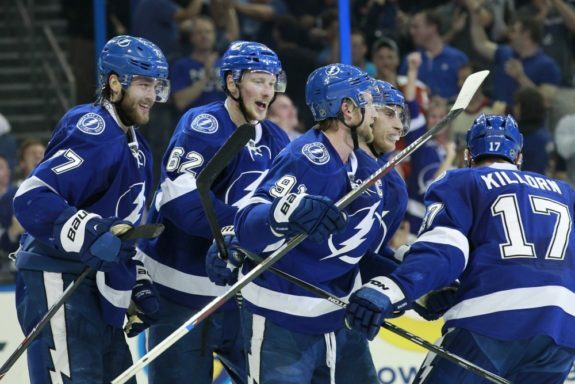 The Lightning began to dominate the play in the third and gained momentum off their power play early in the period. Defenseman Anton Stralman started the play in his own zone making a pass off the wall to Killorn at center, who found Kucherov in full stride down the middle of the ice. The Lightning’s leading scorer of last season came in on his backhand and held off Capitals defender Taylor Chorney, roofing it over Grubauer short side. Kucherov has been showing exactly why he was a 40-goal scorer last season. The 24-year-old is off to a great start with a goal in each of his first three games and it wouldn’t be a surprise to see him top last season’s numbers. Lightning fans should expect to see a few more highlight reel goals from Kucherov throughout the season. With the overtime winner and an assist in Monday’s victory, Point now leads the Lightning in scoring with seven points in three games. He’s arguably been the team’s best player and has shined for them in every game so far. Point was standing in front of the net and deflected a Kucherov a one-timer to win the game on the power play. The former Moose Jaw Warrior has taken his game up a notch this season and has become a dangerous player for the Lightning quicker than most had probably predicted. After making the team by surprise a year ago, the 21-year-old has looked at home in the NHL and is already one of the most relied upon players on the team’s roster. Point has scored at least two points in each of his first three games and it seems like he’s on his way to having a fantastic season.